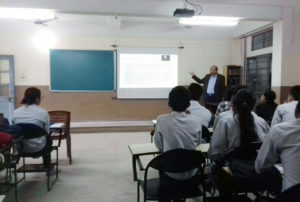 A talk on Electrical Safety was organized by National Power Training Institute (NPTI), NE Region for the B.Tech students of Electrical and Electronics Engineering (EEE) Department on 30 March 2019 at the Azara campus of the university. Mr. Sambit Gantayat, Deputy Director of NPTI-NER, delivered the talk, which was attended by all the B.Tech 6th and 8th semesters students of the department. The primary objective of the programme was to make the students aware of electrical safety in both domestic and industrial applications. The talk started with the origin of electricity and various inventions related to electrical engineering. Mr. Gantayat discussed the Indian Electricity Act-2003, the different types of protections needed for transmitting electrical power through the overhead transmission lines and the different kinds of domestic wirings and earthings being used for this. He mentioned about the safety measures and protections to be practiced by the personnel working in an electrical engineering firm. Further, he discussed the different burn levels due to electricity and also Cardio Pulmonary Resuscitation (CPR), which is a popular emergency procedure that combines chest compressions often with artificial ventilation in an effort to manually preserve intact brain function until further measures are taken to restore spontaneous blood circulation and breathing in a person who is in cardiac arrest. It is worth mentioning here that the EEE Department regularly organizes lectures and symposiums by Industry Experts in an attempt to bridge the industry-academia gap and make the students Industry-ready once they graduate from the University.